The explosive growth of the Internet and all related web technologies has led to an abundance of valuable data. More than ever, companies are building databases of information that need to be shared and presented across the organization. Presenting data in a meaningful and accessible manner is just as important as the actual collection of data. As larger quantities of data are accumulated and the complexity of this data increases, reporting solutions must not only provide a nice presentation but must also include interactivity and real-time calculations and processing. Business users in many organizations rely on spreadsheets to create their reports. Spreadsheets allow them to create complex reports without depending on expensive IT resources. While being a very powerful report creation environment, spreadsheets are far from ideal with the distribution to end users and ongoing report management. 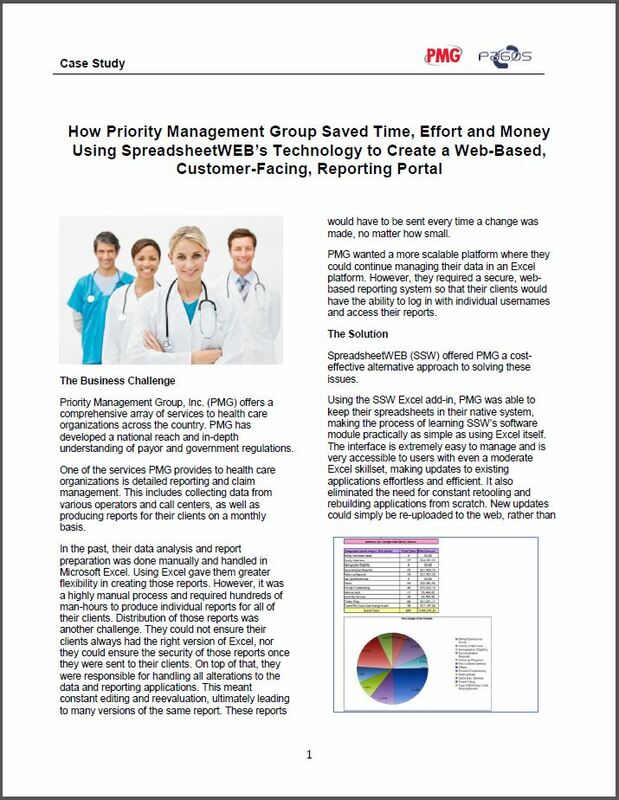 SpreadsheetWEB closes the gap by transforming your Excel reports into secure, database driven, web-based reports without any programming. Without SpreadsheetWEB, we would have wasted hours trying to manipulate, format and consolidate relevant data for our clients and potential customers. Not only did the product do most of the work for us, but it also created dynamic charts and graph to quickly look at and analyze KPI’s. As an added bonus, we are now able to aggregate data across all of our clients (with just a few clicks) to create performance baselines which allows our clients to see where they stand compared to others within their specified line of business. SpreadsheetWEB has literally saved us thousands of dollars in development time and I cannot speak highly enough about the product as well as the very responsive and receptive staff. Executive Director of Technical Services, Priority Management Group, Inc.